Sale by Cant (Highest Bidder) in Chichester House, Dublin 1703 of Galwey lands in East and West Carbery Forfeited, Kilfaghna, Drombeggy, Cullinagh, Dirryleigh, Shrilane, Gortard, Balliisland and ten small islands, Knockeeridane, Castlehaven, Gortard, Creaghm, Coney Island, Baltimore, Raghmore, Cloghanmore, Cloghanbeg, Lissangel, Caheragh, Gortnamuckla Lisalchorig with some tenants listed, Coppingers, Hollow Blade Company, South Sea Bubble. 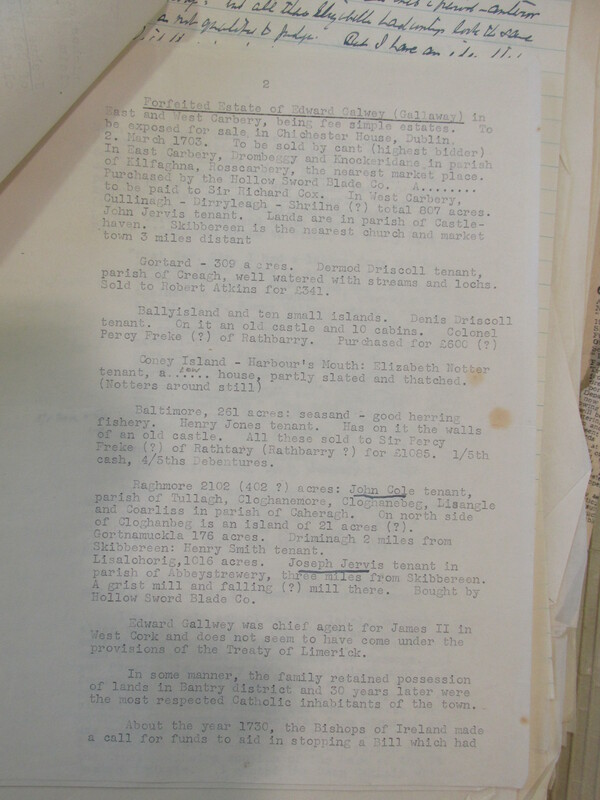 Sale by Cant (Public Auction) in Chichester House, Dublin 1703 of Galwey lands in East and West Carbery Forfeited, Kilfaghna, Drombeggy, Cullinagh, Dirryleigh, Shrilane, Gortard, Balliisland and ten small islands, Knockeeridane, Castlehaven, Gortard, Creaghm, Coney Island, Baltimore, Raghmore, Cloghanmore, Cloghanbeg, Lissangel, Caheragh, Gortnamuckla Lisalchorig with some tenants listed, Coppingers, Hollow Blade Company, South Sea Bubble. Those Irish landowners who backed the wrong horse at the Battle of the Boyne in 1690 had their lands Forfeit by The English who then went through the charade of a legal sale process. These were processed at Chichester House in Dublin. The Irish Parliament at College Green was built on the site of Chichester House which in turn was built on a former nunnery. Somewhat surprisingly claims of widows and children were sometimes allowed. In the 1730s it was estimated that up to two thirds of the business of the Four Courts in Dublin was taken up with contentious land matters. Some of the lands were bought by the Hollow Blade Company which financed King William of Orange wars. When they got into trouble with the South Sea Bubble local landowners purchased the lands in the 1720s. Another family going through the same process was the Coppingers. The Coppingers are of Hiberno-Danish descent. Even still in Cork some of the descendants have blond hair. They were moneylenders/bankers and acquired the lands through the default of the old Gaelic Landowners who borrowed from them. The Freke/Carbery estate was acquired in this fashion. A previous owner had been Sir Walter Coppinger. The Galweys and Coppingers appear in the records of Cork City from the late 13th century and through changes of religion have proven remarkable for their survival instincts. great document, what is its source / who copied it?